We already reviewed an extension designed to add the advanced coupon code functionality to the default Magento platform, and it was Coupon Code Generator by aheadWorks. This time we’d like to draw your attention to Amasty Multiple Coupons for Magento 2 and 1. This module is developed to increase customer loyalty by enabling the usage of several discount coupons in one order. To enhance the existing customer experience, Amasty Multiple Coupons for Magento 2 and 1 offers an entirely new opportunity: your clients can apply several various discounts per one order. This function is not possible in case of the default Magento, but with the extension installed, you’ll enable online shoppers to apply all available promo codes to a particular order getting the maximum possible discount. Such a positive shopping experience will increase both customer loyalty and sales. Besides, there is no need for buyers to be authorized since the multiple coupons feature works for guest visitors as well. Thus, online shoppers who prefer making purchases without getting registered will be more satisfied with your ecommerce storefront. To make the life of your customers even better, Amasty Multiple Coupons displays used coupon codes on the shopping cart and checkout pages. 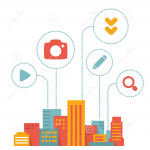 Therefore, buyers can effortlessly track active and inactive codes. Besides, the extension lets customers manage coupon codes. It shows the discounts which are available after applying promo codes, and buyers can remove them right at the shopping cart or during the checkout. 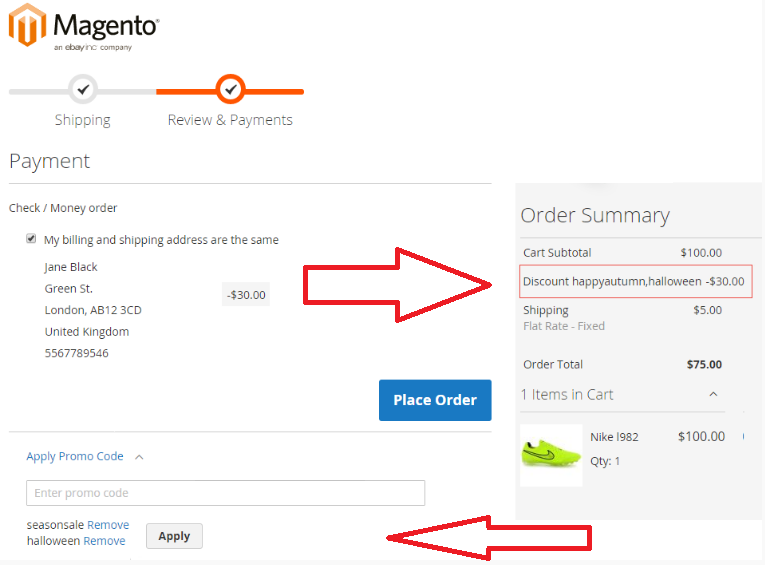 As a Magento owner, you can specify a list of codes that will be used individually. Thus, you will prevent the situation when a huge discount is used together with a discount from a coupon. 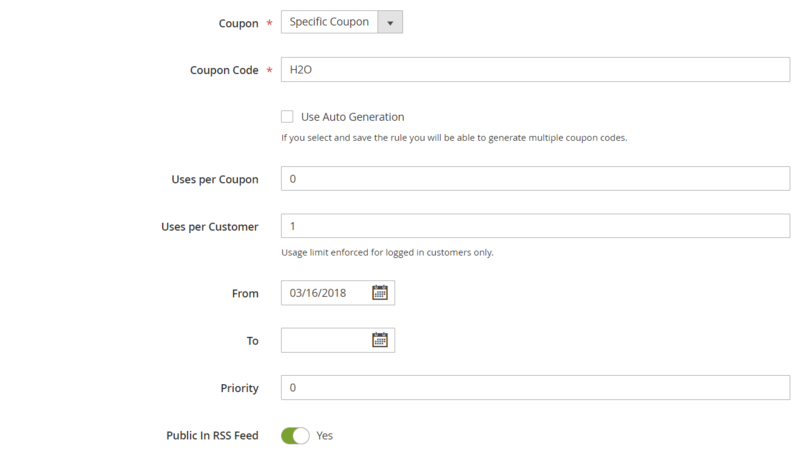 Applying or removing coupon codes for orders placed from the admin panel is also among available features of Amasty Multiple Coupons for Magento 2 and 1. With the help of the extension, you can do it right from the backend interface. You can find the extension’s settings under Stores -> Settings -> Configuration -> Amasty Extensions -> Multiple Coupons. Here you can specify coupon codes that can’t be used with other codes. If any code from the list is applied, the extension removes all other codes. When you create a new rule, you should configure five tabs of settings: Rule Information, Conditions, Actions. Labels, and Manage Coupon Codes. In Rule Information, you specify a rule name and description, enable/disable the rule, and select websites and customer groups to which you want to apply it. Then, you decide whether to use a coupon, create a coupon code (you can use auto generation), and specify the number of uses per coupon and per customer (applied only to logged in customers). Next, you can set a period when the rule will be active and its priority and allow public visibility in RSS feeds. 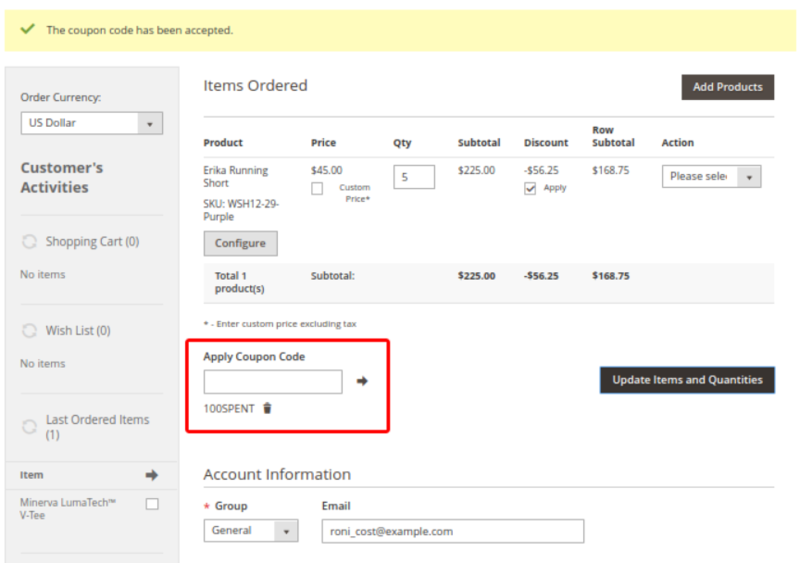 The Multiple Coupons module enables admin users to create various conditions based on cart attributes for the rules. 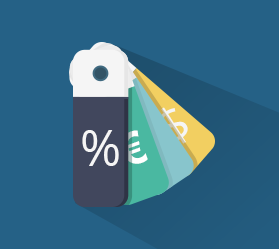 You can select four different actions applied to discounts on your store: Percent of product price discount; Fixed amount discount; Fixed amount discount for the whole cart; Buy X Get Y free (discount amount is Y). For every action selected, you need to specify a discount amount, the maximum number of products to which the discount will be applied, and discount qty step (minimum number of items added to the cart to activate the rule. 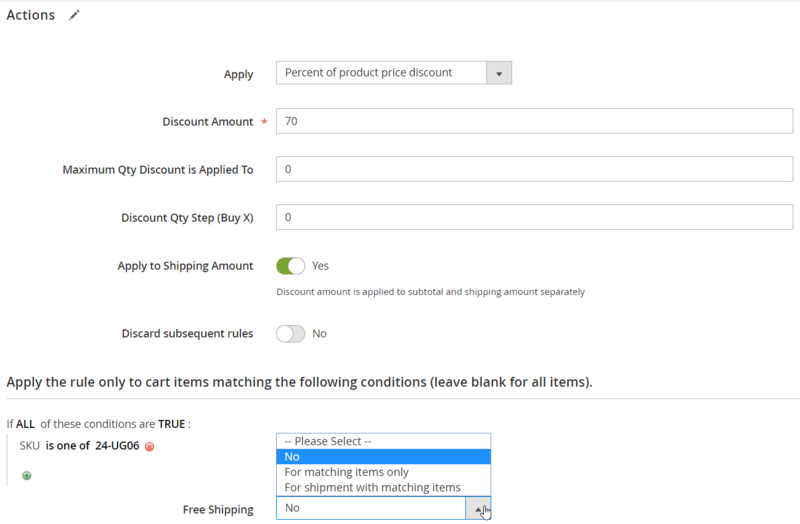 Also, here you enable applying the discount on shipping amount and decide whether to discard subsequent rules. In the Action tab, there is also a conditions section allowing you to select cart item and product attributes, as well as their combinations. Below, it is possible to configure the free shipping options. In the Labels section, specify a default rule label for all store views and store view specific rule names. 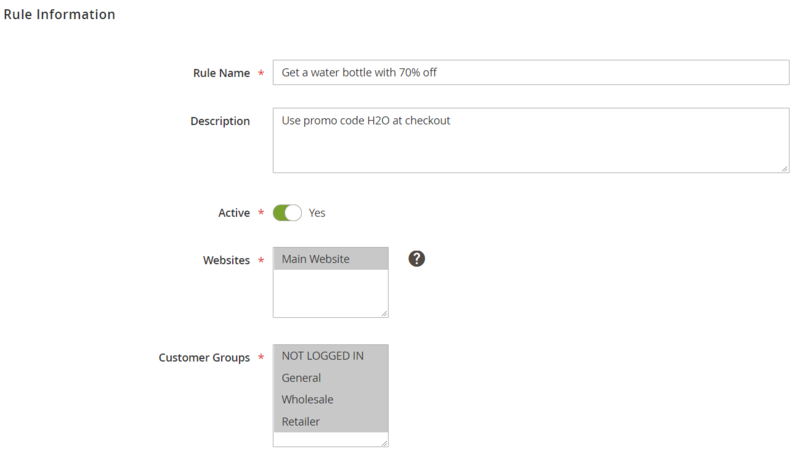 The Manage Coupon Codes tab enables admins to generate coupon codes. Here you specify the number of coupons, a code length, format, prefix, and suffix, and define how characters in the code should be separated. As for applying and removing multiple coupon codes when creating orders in the admin panel, you can do it under Sales -> Orders -> Create New Order. 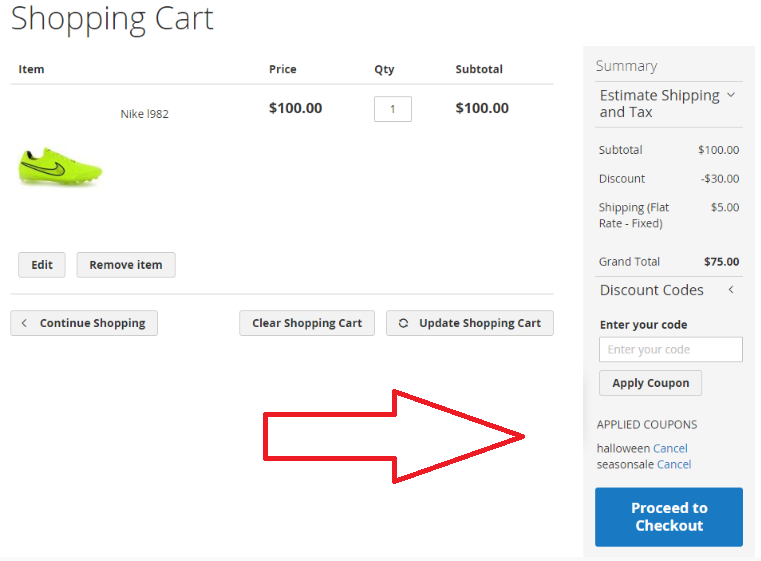 Below, we show how multiple codes are applied on the cart page: you have a field where codes should be entered, a list of used codes, and the Proceed to Checkout button. On the checkout page, the extension has the following implementation: all discounts are listed in the Order Summary section. At the same time, you can apply more codes in the appropriate block on the page. Besides, each code can be removed. New: added a setting to display applied promo rules separately in the discount breakdown. As you can see, Amasty Multiple Coupons for Magento 2 and 1 not only provides the ability to apply multiple coupon codes simultaneously but offers an excellent opportunity to do this wisely since you can specify codes that can not be used with other discounts. 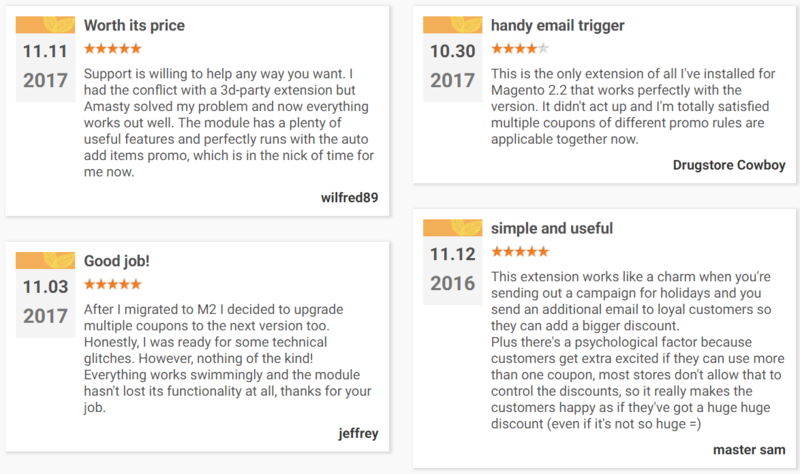 As for the price of the module, Amasty charges $139 for the Magento 2 extension and $79 for its predecessor.